Despite having a first class ticket to ride, some of comics best miss the train and often get left to aimlessly wander the platform, all but forgotten. In Lest We Forget, I pluck a limbo-lingerer's need for a comeback. Today, it's Marvel's 'Everyman Avenger': Thunderstrike. While the word Avenger today means guaranteed sales, in the 90's it wasn't so. Back in the days of The X-Files and Boys II Men, DC was earning plenty of hype for 'replacing' many of their main icons with heroes for the next generation. Flash, Green Lantern, Green Arrow and Robin leading the charge. With all the hype at Marvel focussed on the X-Men of the time, few headlines were written about the fact The House of Ideas was also quietly and assuredly doing the same to Captain America, Iron Man and Thor. U.S.Agent is now a paraplegic drill-sergeant in Thunderbolts, War Machine has a new solo title under the stupid moniker of Iron Patriot, but Eric Masterson, aka Thunderstrike is dead and his son tried to host his mantle in a worse-than-death mini-series. Kevin needs to return. Darkhawk and Sleepwalker were my two top solo title Marvel heroes of the 90's, but sitting just off to the left of the podium was Eric Masterson. The man who lived in the shadow of Thor, one both placed on him by the public and by his own feelings of unworthiness. Balancing being a father with overcoming the idea the natural hero inside him had to measure up at all, was typical Marvel stuff, but handled by Tom Defalco and artist Ron Frenz (inked by Al Milgrom), it was lightning in a bottle here. The one-time Thor and Avenger, Eric had a wicked take on the classic Thor costume, but always felt like a fifth wheel. Taking the name 'Thunderstrike', he swapped cape for a 90's leather jacket, hammer for a mace, and finally clicked in place. Plastered upon the covers was the catchphrase 'The Everyman Avenger' - which isn't a title that ramps up the excitement levels in many teenagers - yet despite this, this was what made Thunderstrike soar. On panel, he refused the Asgardian trappings of his idol's lifestyle in order to tackle things like guns in school and the ongoing mystery that one of his closest friends had been corrupted and turned into his arch-rival, Bloodaxe. As the Bloodaxe tension built through each issue, its finale is still one of the best 'ways to go out' I've ever read, and I'm continually surprised it rarely ranks when comparing sacrifices made in comics. If you haven't read it yourself, trust me, you should. It's a doozy. HOW I'D GET THUNDERSTRIKE MOVING AGAIN: I'd kick off a Marvel Knights type imprint, where four of Marvel's 90's hits returned for a guaranteed 12 issues. Darkhawk, Sleepwalker, Thunderstrike, and Gambit - because lets face it, he hasn't been the same since either. Eric's mantra would remain the same. Turning his back on the God's to save yours, and you know what, I'd keep the leather jacket too. If it can be done right, with the right writer, I'd go for him returning. Otherwise, I don't think Thunderstrike in general ever aged well. Don't get me wrong; I thoroughly enjoyed the character of Eric Masterson when he became Thor for awhile, It's just that he was so obvious a second-stringer, that even a name change couldn't help. Better clothes perhaps could've gone a long way, but it was the 90's. The sleeveless leather jacket, earring, and ponytail... even then I thought they were trying way too hard to make Thor seem "cool". It failed. For me, anyways- I never got into it. And like Dale said- the look was outdated almost instantly. "He's definitely NOT your FATHER'S Thunder God!" -Ugh, shut up! *barf* Some 90's stuff is just TOO 90's! I'm with you on Darkhawk, and Sleepwalker- but I never liked Gambit either. 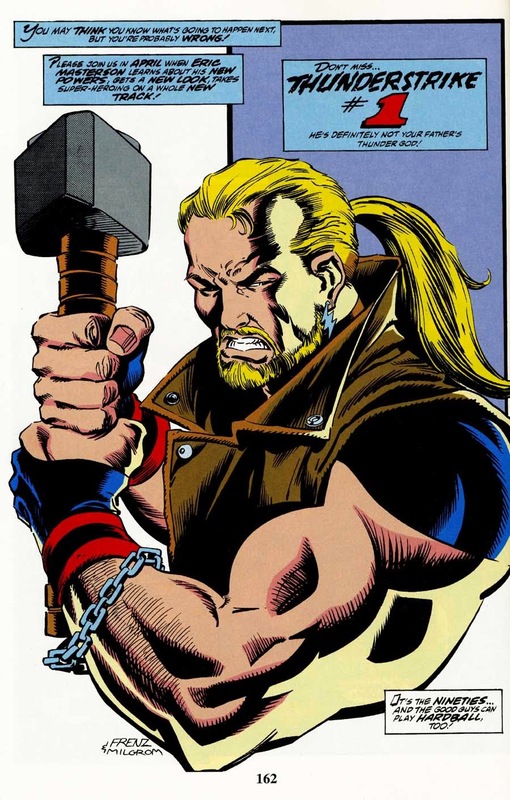 Thunderstrike definitely needs an update, he's just too closely identified as a Thor clone. A name change perhaps but deffo a new 'costume' [something more down to Earth, a streetwise kind of Thor] and an 'attitude' would help. i know next to nothing about the Thunderstrike character (a.k.a Eric Masterson?) but i always thought he had a really cool look. I'm with Dave - I liked the look. Mind you I liked the book too (hence the post). No idea where I got Kevin from. Too much caffine or something! I was a big fan of this title because they stuck with one creative team for a very long time. I loved when they introduced the Egyptian god characters which were also very well done.